These days, wireless networks are everywhere. With users being on the go like never before, having to remain stationary because of having to plug into an Ethernet cable to gain Internet access is not feasible. For this convenience, there is a price to be paid; wireless connections are not as secure as Ethernet connections. In this tutorial, we will explore a new method for cracking WPA/WPA2 networks with an open source python script wifibroot. 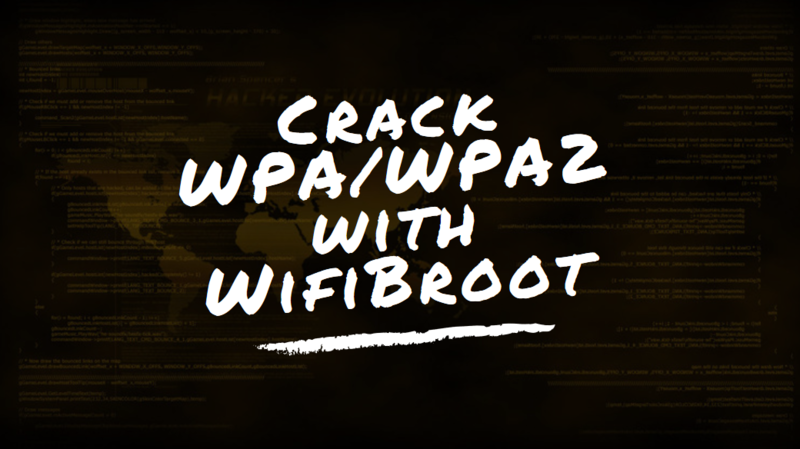 WifiBroot is an extensive tool which helps you to crack WPA and WPA2-PSK based wireless networks and is still under development. Before to run WifiBroot, make sure that your wireless interface(wlan0) must be in Monitor Mode(wlan0mon) which you can easily done with airmon-ng start <wireless interface> command. So in our case, it is wlan0mon which we’ll use in further commands. –verbose for verbose output which prints hash values too at the end. If in case, you didn’t mention any dictionary file path then this tool has its own in-built dictionary file located at /dicts/list.txt which works under normal mode. So this tool will automatically scan all the nearby wireless networks and print all the required information like ESSID (Name of the wireless network), BSSID (Mac Address of the wireless network), Channel No (1 to 13), Encryption Type (WEP, WPA or WPA2) and PWR (In dbm) value. 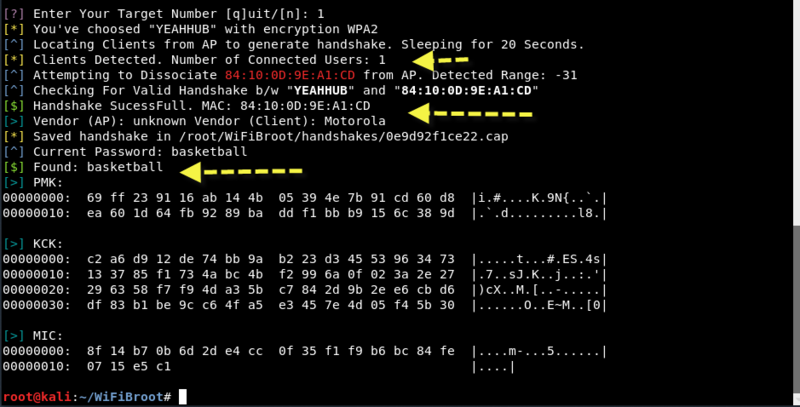 So here, we selected (1) whose ESSID is “YEAHHUB” and BSSID is “0E:9D:92:F1:CE:22”. After that, it will automatically searches for all connected clients for handshake generation and the script will listen for default 20 seconds which you can further set the timeout option for listening on the clients with -t <value>. And the best thing about WifiBroot is that, the script will automatically arrange all the connected clients based on the range reported by the interface which actually increase the chances of generating handshake in less time. For research facilities, verbose mode will show you live packets as soon as they get captured and will print hexdump of computed hashes. The hashes will include, PMK (Pairwise Master Key), PTK (Pairwise Transient Key) and MIC (Message Integrity Code). To Crack the password, there is a built-in dictionary in the folder dicts (as already discussed) which contain some of the most dumb passwords. In extension to that, wifibroot also check for default passwords which increase it’s credibility of finding the right hash. At this stage, you can provide your own dictionary or pass a comma separated string to -p argument like -p “password1,password2,password3”.